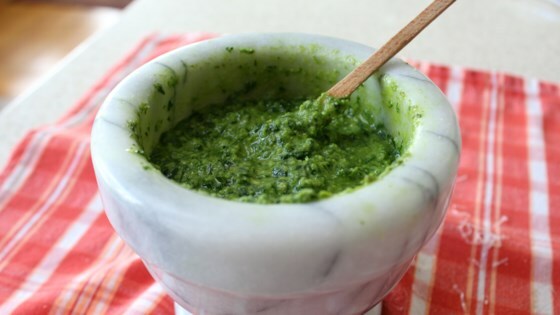 "There are lots of recipes people claim taste better if made by hand, but there's no easier case to prove that than pesto. The intensity of the flavors is beyond compare, and as if by some kind of magic, this gorgeous spread develops an addictive spiciness. You can taste each ingredient, and yet when smashed together, new and wonderful flavors are released." Crush garlic and pinch of kosher salt in a mortar with the pestle until garlic is mashed and paste-like, 1 or 2 minutes. Add basil in 3 or 4 additions, crushing and pounding down the leaves until they form a fairly fine paste, about 8 minutes or more depending on size of leaves and thickness of stems. Add and pound in pine nuts. Transfer a handful of grated cheese to mortar and pound into the sauce. Add another handful of cheese and incorporate into the mixture. Continue adding cheese a handful at a time until completely incorporated, about 5 minutes. Drizzle in olive oil 1 tablespoon at a time, pounding it into the sauce. When all the olive oil has been added and emulsified into the mixture, transfer pesto to a bowl and drizzle surface with olive oil. The bunch of basil should weigh about 4 or 5 ounces. Use a microplane to finely grate the Parmigiano-Reggiano cheese. Two ounces should yield about 1 1/2 cups unpacked grated cheese. Of course, you can play around with the ratios of the five ingredients, and easily adjust this to your tastes, but no matter how they're combined, taking the time to crush them by hand is well worth the effort. Got a mortar & pestle just to try this with summer's bounty of basil. Outstanding! After my first batch I watched the video and it gave me a better idea of the technique. Thanks Chef John. This was a simple recipe that tastes great. I was able to divide the amount into small jars and freeze what I didn't need. Really delicious!! So fresh!! Excellent summer dish to beat the heat. Made it, no changes necessary, freaking amazing! Thank you Chef John! !